This is the first part of a new chapter in my book From Polar Bears to Porcupines. 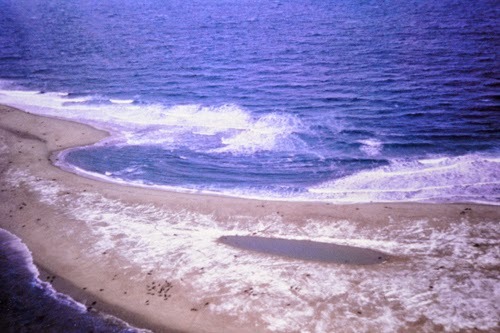 In 1978 I traveled to Sable Island off Canada's east coast to start a research program on seals. The beauty of working as a half-time zoo veterinarian was that it gave me the opportunity to pursue the free-ranging wildlife side of my university post. It gave me, as it were, some free rein. 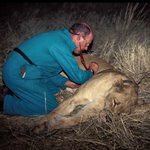 Apart from the amazing opportunity to get involved in moose research with Bob Stewart and his team I had had to make most of the overtures myself. When a call came in from Ottawa and the man identified himself as Dr. Harry Rowsell I was at first confused. He quickly put me at ease by telling me that he had been a member of our own faculty as a pathologist and was now working in the medical school in the national’s capital in the same capacity. He named several of my colleagues who worked downstairs and referred to my interest in wildlife. From there he quickly segued into an interesting pitch. Of course I was at once interested, if a little puzzled as to the reason for the call. I half mumbled an Mh-Hh. You can no doubt imagine my very enthusiastic reply, although I did warn Dr. Rowsell that I had never worked with seals. I did not tell him that I had hardly ever seen one and that I had no idea where Sable Island was. The basic need centred around the fact that the summer grounds of the hooded seals that pupped near the Magdalen Islands were unknown and the COSS folks wanted to know more about their ecology and lives in order to protect them. It was known that they pupped and bred in spring in the Gulf of St. Lawrence, but where they got to after that was a complete mystery. The plan, as Dr. Rowsell outlined, was to go to Sable Island and test systems on the grey seals that have their pups on the sandy beaches there. If we could develop a good technique then we could apply that to the hooded seals. The critical factor was the date for our trip. It had to take place in the very short period between Christmas and early February when the seals would be on land. They would either be about to pup, feeding a newborn, or breeding. As soon as the pups were weaned and the males had done their thing the seals would be back out to sea and feeding on fish. The narrow window had everything to do with the remarkable life style of the pups. They weigh about 15 kg at birth and for the next three or four weeks they put on weight at a furious rate as they suckle five or six time a day for up to ten minutes. The milk is rich in fat and by a month or so they have at least tripled their weight! As soon as the pups are weaned the adults get on with propagating the next generation. The flights from Saskatoon to the east coast were uneventful and as we had all met at the Toronto airport I had a chance to get to know Dr. Rowsell, or Harry as he insisted I call him, a little better. He was one of the most charming and gentlemanly people I have ever met and we shared a common interest in many things related to the environment and conservation. Tom Hughes was a bluff Yorkshireman and we shared a common bond as my parents had lived near the City of York for four years after my dad retired from the Highland Light Infantry and learned the ropes as a salesman for King George IV whisky, a Distillers Company Ltd product. My first student job had involved injecting gelatin into pork pies in a factory right opposite the Rowntree’s chocolate headquarters on the northern edge of the city. After an overnight stay in Halifax we headed to the airport and I was astonished to see that we were to travel to Sable Island in a three-engine plane known as the Trislander. The engines are not where you might think. There are one on each wing and the third is near the rear on a rocket-like projection just in front of the tail. The island part of the name refers to the Isle of Wight off England’s south coast. My amazement took me back many years in a flash to family connections. Both of my grandmothers had lived on the IOW for many years. Granny Haigh had moved there from Scotland after her husband, my naval captain grandpa, had died. My Wall grandparents moved to the town of Cowes where granddad, a naval architect and a naval engineer (a rare combination) lived out the last ten years of his life. The two grannies lived half an hour apart by road, but when I was a lad that was too far to go on the island’s narrow twisting roads for just one meal. It had to be lunch and tea or tea and supper. The Trislander had been developed in the town of Ventnor on the island’s southern coast a mere half-hour drive from either grannie. The pilot explained that the big advantage over other aircraft was that the plane could both land and take off in a very short distance which was a good thing because Sable Island did not have an airstrip and we would have to put down on the northern beach at low tide. This gave us a narrow window for arrival. We had almost 250 km to go and conversation, other than at high volume, was not really an option. I drifted off into snooze and woke when we began our descent. Seals dot the beach just left of centre at left. I was too late to take a snap of the whole island, which seemed to stretch in a long lazy curve a long way to the east. I later learned that it is about 40 km long, but beneath me all I could see was a stretch of sand with what I assumed to be seals dotted along it. A taciturn elderly staff member picked us up from the beach and drove a short distance in a battered old Ford half-ton to the main station. He explained that the island had been continuously occupied since 1801 and was now principally a government weather station. Part of his attitude was probably due to the fact that he was one of the last people to have been born on the island. I suspect that he resented our presence and did not like what he may have seen coming in the way of a tourist invasion. 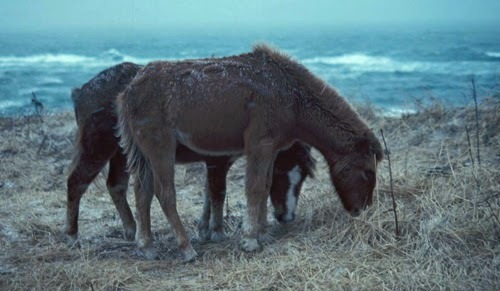 Sable Island only became a National Park in 2013, thirty-five years after my visit. Before that it had been a rescue station for mariners (which it still is), a Coast Guard Station and had the dubious distinction of having two light houses, one at each extremity of its long crescent, because its other name is The Graveyard of the Atlantic. There have been at least 350 shipwrecks there so the name is well earned. One consequence of those many wrecks, especially ones in the days of the sailing ships was the establishment of a thriving population of horses. As we had arrived at midday there was no chance to get to work right away so I took the chance for a late afternoon walk over the dunes beyond the buildings. I soon saw the descendants of those unfortunate beasts. Whatever the horses had looked like when they left Europe they were now ponies. They were all much of a size and almost uniform in colour, from dark to light brown. I saw them in procession along the beach and closer up, as they had no fear of man. In late February their heavy winter coats made them look scruffy, but smart was not what they needed to be. Warm and windproof was the order of the day as the winter gales swept in from the open Atlantic. After exploring a number of the blog articles on the web page, I truly such as your way of writing a blog. website as well and inform me how you feel.